The Greek post-Byzantine school of iconography became prominent in the years following the Fall of Constantinople in a.d. 1453 to the Moslem invaders. This icon is of that period and of that artistic style as it was painted in the Greek speaking lands in about 1600. 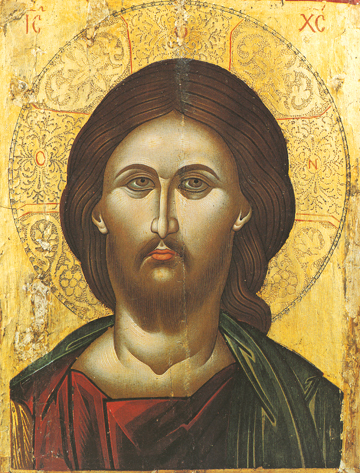 Dark-accentuated hair, beard, eyes and moustache, along with the light-skinned face show a beauty that is consistent with the belief that Christ was truly beautiful, and those who opened their hearts could perceive that beauty that revealed the inner light of the Kingdom of God come on earth. In this icon Christ is most expressive, looking at our hearts to call us up to Him and make us self-aware of our fallen and sinful condition so that we might desire to change or repent. This repentance grants great freedom to us. We see Christ not as just a man, even a most beautiful man, but as the “Ruler of All” (which in Greek is “Pantocrator”) for He is limited by neither Time or Space, nor even of our own limited ideas of existence and purposeful or un-purposeful meaning in life, but is the shining revelation of Life Itself. May we be illumined this day by approaching and loving the God Who made us.